When the weather outside is frightful, it's not always so delightful for our furry friends. If you're cold, your dog or cat probably is, too. Pet safety is always paramount, but it's especially important to be aware of in the winter months. Fortunately, there are precautions we can take to protect our four-legged pals from seasonal danger. Let's have a look. Please note: This information is not intended as a substitute for professional veterinary advice. If you have a specific question or concern involving your pet's health or safety, contact his or her medical provider. Don't leave pets out in the cold. This one seems fairly obvious, but sometimes we overestimate the warmth an animal's fur coat really provides. When the temperature drops, bring your dog or cat indoors with you. According to the Humane Society, pet cats should not be left outdoors during the winter under any circumstances — even if they're free to roam outside during other seasons. If your dog is outdoors for any substantial period of time, he or she will need access to a dry, draft-free shelter that's large enough to move around comfortably but small enough to hold in body heat. The floor of this shelter should be raised a few inches from the ground and covered with cedar savings or straw. Per the Humane Society, the doorway needs to be covered with waterproof burlap or heavy plastic. And of course, the dog will need easy access to fresh water that isn't frozen. Snow and ice don't always feel so nice to the pads of your pup's feet. 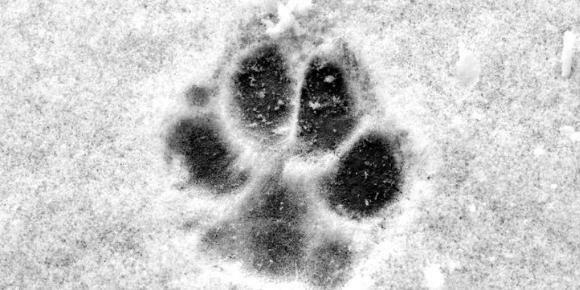 For your safety and your pet's, it's best to avoid traveling on icy paths as much as possible. After your walk, make sure to check your dog's feet for any snow or ice that may be stuck in her feet. Sidewalks and roads which have been de-iced can also pose a danger. Use pet-safe ice melters on your property, but be aware that others may use de-icing salts and mixes that can be toxic to animals. Regular, untreated salt and its remnants can sting the dog's paws and crack the pads of their feet, too. There are a number of protective dog booties on the market, and wearing these provides a barrier between your pet's paws and any potentially dangerous de-icing agents underfoot. If you do utilize a pair of pet booties, make sure they fit properly. According to WebMD for pets, they should be snug but not too tight — otherwise, you risk cutting off your dog's circulation and inviting frostbite. If boots aren't an option for your dog, massaging some petroleum jelly on his or her feet before heading outside can help protect their paws from salt and chemical agents. You can also gently towel off their feet after walking and apply a paw salve like Ruff Relief Balm to help prevent chapping. Some dogs shed — that's just a fact of life. Their coats help keep them warm which is why, according to the ASPCA, you should never shave your dog down to the skin in the winter. If you do have a long-haired dog, you can trim his or her coat to minimize clinging ice balls and salt crystals. Short-haired dogs may be more comfortable wearing a coat or sweater when it's cold out. Keep an eye on this, though, because if a dog's outerwear gets wet or even damp, it may end up making him or her even colder. One good thing about the winter months is that it's actually better to bathe your dog less. Washing them too often can strip their skin of natural essential oils and increase the chance of developing dry and flaky skin. Toweling off your pup after each walk will to keep them cleaner longer and also rids them of any stuck-on snow, ice or salt. We all know not to leave a dog in a hot car, but a cold vehicle can be dangerous, too. Even if it doesn't feel that chilly outside, the car can act like a refrigerator and hold the cold in. This can result in an enclosed pet suffering from hypothermia or even freezing to death. On the flip side, a warm car can be an appealing but deadly heat source to feral and outdoor cats. A quick check underneath your car, a bang on the hood, and a honk of your horn could be the warning they need to get away from the vehicle and avoid an untimely death. Lastly, make sure your car is not leaking antifreeze. Even a tiny amount of it can be fatal to cats or dogs. If you store any antifreeze in your garage, make sure it's in a tightly sealed container and inaccessible to pets. If a blizzard leaves you stranded or knocks the power out for days, you'll supplies for your pets, too. The American Veterinary Medical Association recommends you prepare a disaster/emergency kit that includes any family pets. Make sure to have any medicine they need (including prescription medications and heart worm and flea/tick preventatives) and enough food and water on hand to get through at least 5 days. Thank you to the Patch.com for the helpful article!